•The Arch is the tallest national monument in the United States at 630 feet; it is the city’s best known landmark and a popular tourist attraction. •Construction began February 12, 1963 and the last section of the Arch was put into place on October 28, 1965. •The Arch is a structure known as a catenary curve, the shape a free-hanging chain takes when held at both ends, and considered the most structurally-sound arch shape. The span of the Arch legs at ground level is 630 feet, the same as its height. •Each year, approximately a million visitors ride the trams to the top of the Arch. The trams have been in operation for over 30 years, traveling a total of 250,000 miles and carrying over 25 million passengers. •The Arch weighs 17,246 tons. 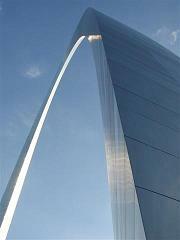 Nine hundred tons of stainless steel was used to build the Arch, more than any other project in history. •The Arch was built at a cost of $13 million. The transportation system was built at a cost of $3,500,000. •In order to ensure that the constructed legs would meet, the margin of error for failure was 1/64th of an inch. All survey work was done at night to eliminate distortion caused by the sun’s rays. Since the Arch was constructed before the advent of computer technology, relatively crude instruments were used for these measurements. •The Arch sways a maximum of 18″ (9″ each way) in a 150 mph wind. The usual sway is 1/2″. This picture was taken on my trip to New York on Thanksgiving Weekend. The Chrysler Building is an Art Deco skyscraper in New York City, located on the east side of Manhattan in the Turtle Bay area at the intersection of 42nd Street and Lexington Avenue. Standing at 319 metres (1,047 ft), it was the world’s tallest building for 11 months before it was surpassed by the Empire State Building in 1931. After the destruction of the World Trade Center, it was again the second-tallest building in New York City until December 2007, when the spire was raised on the 365.8-metre (1,200 ft) Bank of America Tower, pushing the Chrysler Building into third position. In addition, The New York Times Building which opened in 2007, is exactly level with the Chrysler Building in height. The Chrysler Building was designed by architect William Van Alen for a project of Walter P. Chrysler. When the ground breaking occurred on September 19, 1928, there was an intense competition in New York City to build the world’s tallest skyscraper. Despite a frantic pace (the building was built at an average rate of four floors per week), no workers died during the construction of this skyscraper. Van Alen’s original design for the skyscraper called for a decorative jewel-like glass crown. It also featured a base in which the showroom windows were tripled in height and topped by twelve stories with glass-wrapped corners, creating an impression that the tower appeared physically and visually light as if floating on mid-air. The height of the skyscraper was also originally designed to be 246 metres (807 ft). However, the design proved to be too advanced and costly for building contractor William H. Reynolds, who disapproved of Van Alen’s original plan. 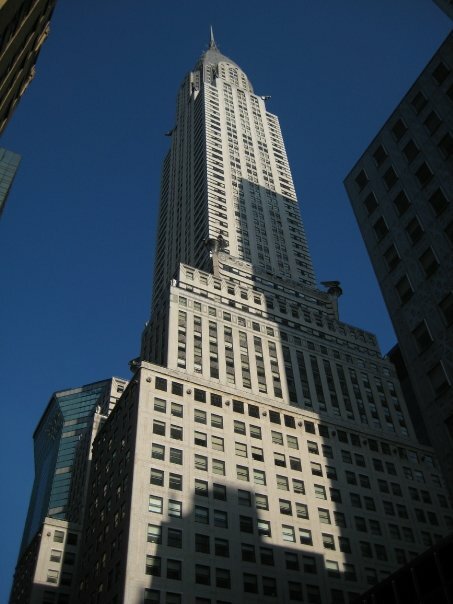 The design and lease were then sold to Walter P. Chrysler, who worked with Van Alen and redesigned the skyscraper for additional stories; it was eventually revised to be 282 metres (925 ft) tall. As Walter Chrysler was the chairman of the Chrysler Corporation, various architectural details and especially the building’s gargoyles were modeled after Chrysler automobile products like the hood ornaments of the Plymouth; they exemplify the machine age in the 1920s (see below). The Auditorium Building in Chicago, Illinois is one of the best-known designs of Dankmar Adler and Louis Sullivan. Completed in 1889, the building is located on South Michigan Avenue, at the northwest corner of Michigan Avenue and Congress Parkway. 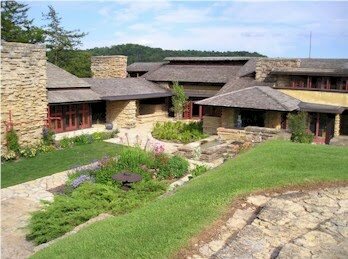 It was declared a National Historic Landmark in 1975. It was designated a Chicago Landmark on September 15, 1976. In addition, it is a historic district contributing property for the Chicago Landmark Historic Michigan Boulevard District. Since 1947, the Auditorium Building has been the home of Roosevelt University. 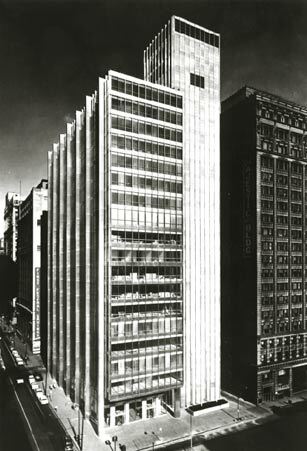 Adler and Sullivan designed a tall structure with load-bearing outer walls, and based the exterior appearance partly on the design of H.H. 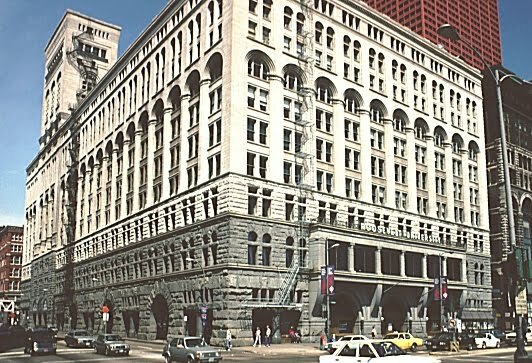 Richardson’s Marshall Field Warehouse, another Chicago landmark. The Auditorium is a heavy, impressive structure externally, and was more striking in its day when buildings of its scale were less common. When completed, it was the tallest building in the city and largest building in the United States. One of the most innovative features of the building was its massive raft foundation, designed by Adler in conjunction with engineer Paul Mueller. The soil beneath the Auditorium consists of soft blue clay to a depth of over 100 feet, which made conventional foundations impossible. Adler and Mueller designed a floating mat of crisscrossed railroad ties, topped with a double layer of steel rails embedded in concrete, the whole assemblage coated with pitch. The resulting raft distributed the weight of the massive outer walls over a large area. However, the weight of the masonry outer walls in relation to the relatively lightweight interior deformed the raft during the course of a century, and today portions of the building have settled as much as 29 inches. This deflection is clearly visible in the theater lobby, where the mosaic floor takes on a distinct slope as it nears the outer walls. This settlement is not because of poor engineering but the fact the design was changed during construction. The original plan had the exterior covered in lightweight terra-cotta, but this was changed to stone after the foundations were under construction. Most of the settlement occurred within a decade after construction, and at one time a plan existed to shorten the interior supports to level the floors but this was never carried out. In the center of the building was a 4,300 seat auditorium, originally intended primarily for production of Grand Opera. In keeping with Peck’s democratic ideals, the auditorium was designed so that all seats would have good views and acoustics. The original plans had no box seats and when these were added to the plans they did not receive prime locations. Housed in the building around the central space were an 1890 addition of 136 offices and a 400-room hotel, whose purpose was to generate much of the revenue to support the opera. While the Auditorium Building was not intended as a commercial building, Peck wanted it to be self-sufficient. Revenue from the offices and hotel was meant to allow ticket prices to remain reasonable. In reality, both the hotel and office block became unprofitable within a few years.